Does anyone know what book/article this could be from? Found it over on @conscious_counsellor. Maybe a book called “Heaven and Hell Within”? I did an image search. :) Either way, love it!! Looks like Maslow’s hierarchy of needs? Or a version of it. Was fear vs love the message of the self-help charlatan played by Patrick Swayze in “Donnie Darko”. I do like this tho. I will check the comments to see if someone identifies it. Looks like a list originally from Power vs. Force by David Hawkins (who died recently), from 1995 or before. He described levels of consciousness like this. 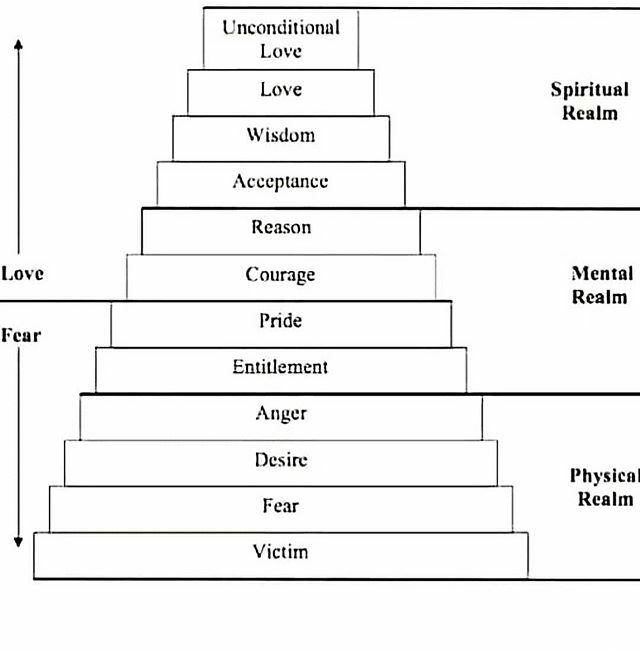 Fear vs Love is also the central idea of Gerald Jampolsky’s Teach Only Love. You know, sometimes I doubt your commitment to Sparklemotion! Very Donnie Darko. Love isn’t the opposite of fear.